Above - Neotinea tridentata subsp. 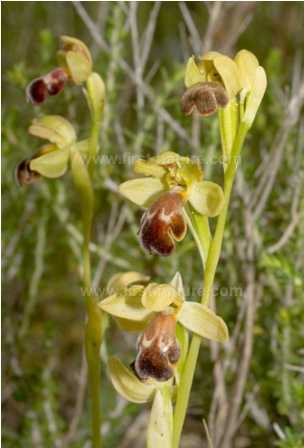 conica is one of the first orchids to flower in springtime in the Algarve, often appearing as early as February in favoured spots. This exceptional clump of plants was photographed by Simon Tarrant but found by his wife, Moira, in mid-March close to Fonte de Benemola. 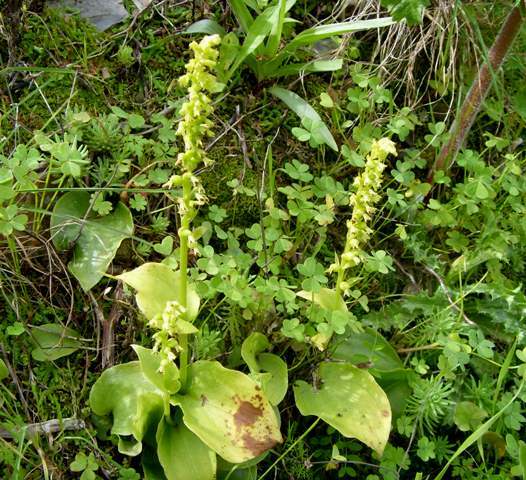 The Conical Orchid frequently grows in dry rocky habitats in partial or full sunshine and is one of the less common orchid species in the area. For those of us accustomed to seasons further north in Europe, the seasons in the Algarve come as a most welcome suprise. After a long, hot and dry summer we, and gardeners in particular, long for the first rainfall although we are often kept waiting until October or November for the first significant inundations. The rain immediately stimulates the grass to start growing, and this is quickly followed by other plants. We often find that, by the end of December, our brown and parched landscape has been miraculously transformed in a green wonderland that we would not expect to see until April or May further north. Along with the first flowers come early butterflies including Speckled Wood, Red Admiral and Small Tortoiseshell. 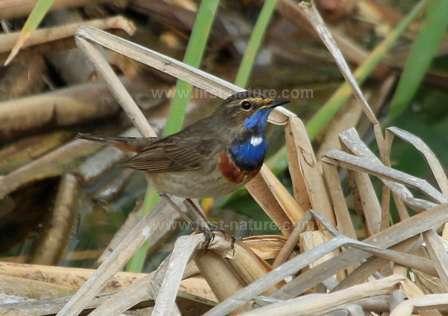 The early part of the year is also one of the best times to see migrant birds including occasional rarities blown off course by inclement weather conditions encountered during their long and perilous journeys back to their breeding grounds. Exceptionally warm and wet weather during the winter months means that the spring flowers of the Algarve can often be found as early as January, and sometimes even in December. 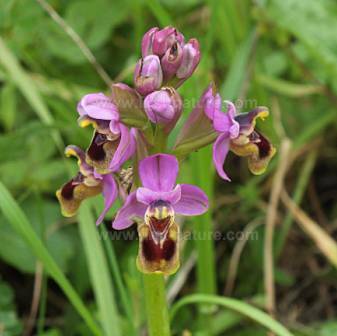 Flowers to look out for in January include almond blossom, Common Asphodel and some orchids including the Sombre Bee Orchid Ophrys fusca. Another orchid always in flower in January is the difficult-to-spot Two-leaved Gennaria which is green throughout and wonderfully camouflaged in the grassy habitats in which it grows. 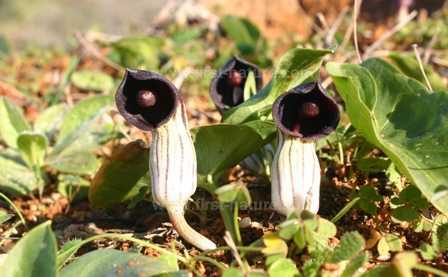 Above - Friar's Cowl Arisarum vulgare flowers from December to March in the Algarve. It is easier to spot the arrow-head shaped leaves than the flowers initally but perserverance soon pays off. 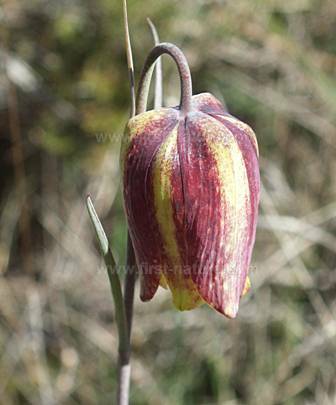 This cute humbug of a flower is a strong indication that many more spring flowers will soon follow. Two-leaved Gennaria - Gennaria diphylla is the first orchid to flower in the Algarve and is common at Cape St. Vincent and other coastal areas. In other parts of the Algarve it is localised. 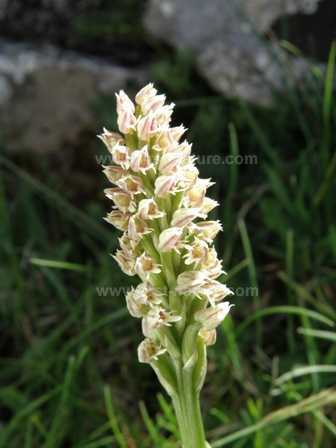 Look for this unassuming orchid in January when it will be in full flower. Sombre Bee Orchid Ophrys fusca in full flower in the Algibre Valley in January. 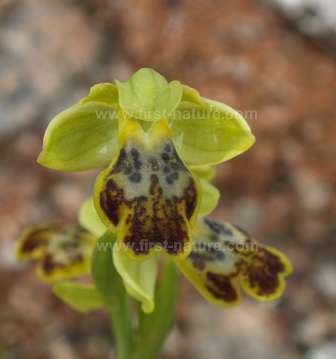 This orchid is very common in the Algarve and competes with several other Ophrys species to be the first to flower each year. A shortage of rain in the Algarve during spring need not be an impediment to the growth of the Conical Orchid Neotinia tridentata subsp. conica (pictured above) since its favoured habitat is dry, rocky limestone locations which drain quickly after spring showers. 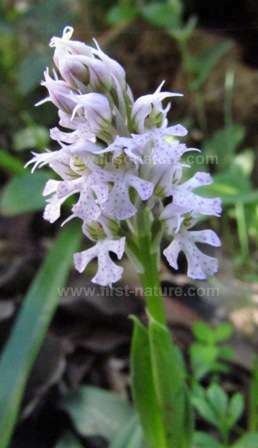 Until recently this orchid's scientific name was Orchis conica but the increasing use of DNA study to determine more accurately the relationships between plants has lead to it being reclassified and placed in the Neotinia genus. It joins two very similar-looking species, Neotinia lactea (Milky Orchid) and Neotinea tridentata subsp. tridentata with which it is easily confused in countries where two or more of the orchids are known to occur. 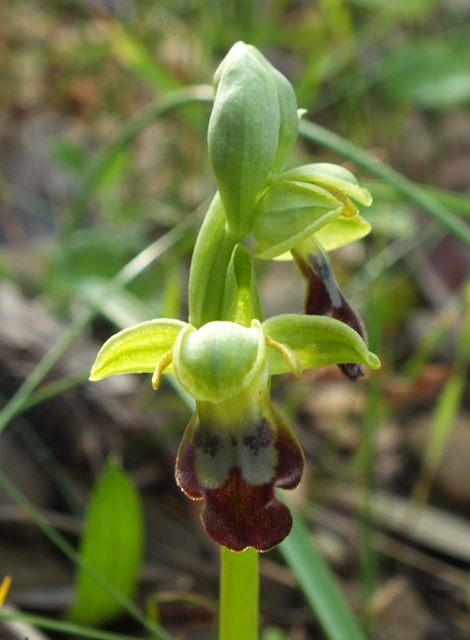 In the Algarve the only species recorded (so far) is Conical Orchid and so finders of this widespread but rare (in the Algarve) species can be confident of accurate identification. Above: Omega Ophrys Ophrys dyris - this orchid often flowers as early as February in sheltered habitats in the Algarve. Often confused by the superficially similar-looking Ophrys fusca (above), there are three distinguishing features to look out for when determining the identification of this species. The flower lip has a distinctly curved appearance resembling a boxing glove, the lip is covered in a thick coating of white hairs, and the speculum (mirror) on the flower is bordered by a very strong white-sh W-shaped mark resembling the Greek Omega symbol. One of the synonyms of this orchids is Ophrys omegaifera reflecting this last distingushing feature. Neotinia maculata - Dense-flowered Orchid also flowers early in the Algarve. Although regarded as rare I think it's diminutive size makes it very difficult to spot and that it is far more common and numerous in the Algarve than most people expect. Many species of orchids readily hybridise with each other producing curious-looking flowers which feature colour and characteristics from both 'parents'. Hybrids are the result of a pollinating insect carrying pollen from one species to another rather than between two plants of the same species. Many of the bee orchids are difficult to tell apart because of naturally occuring variability within species, and the presence of hybrids can add to the confusion. Strange-looking orchids are not always the result of cross pollination. So called aberrant or 'monstrous' forms can also be caused in species which have the ability to self-pollinate if insect pollination fails to take place. Two of the best Orchid Walks in early springtime - and what you can expect to see there. All the Algarve wild orchid species returned in greater numbers than before the drought and we found many species in places where we had not found them before. The plateau on the top of the limestone escarpment of Rocha da Pena had large numbers of Early Purple Orchids - Orchis mascula during March, and the Woodcock Orchid - Ophrys scolopax has been much more numerous in its usual stations than usual, as well as appearing in many places where we had not found them previously. 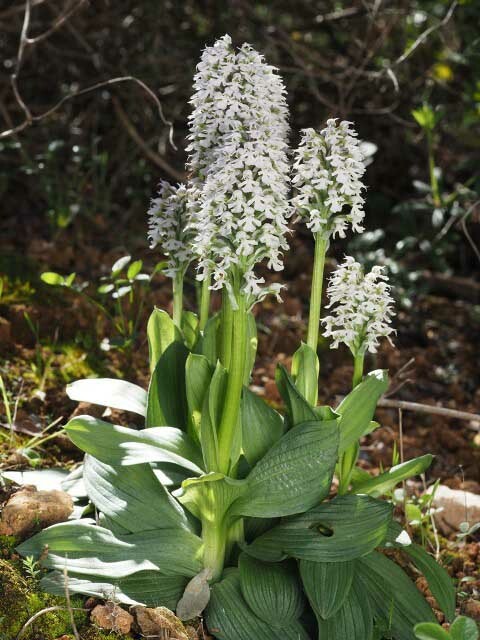 Early spring (from January to March) is the best time to see two of the rarest plants in the Algarve. Travel to Cape St. Vincent to pay homage but please do not dig up and remove - these plants are rare enough as it is. 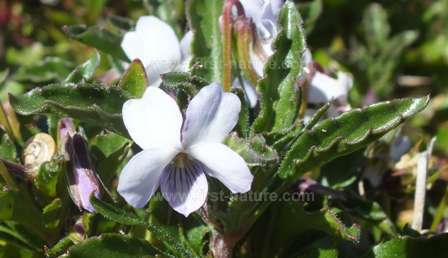 Woody Violet Viola arborescens is a low-growing plant that hides among other woody and prickly shrubs on Cape St. Vincent. You will need thorn-proof trousers and something to kneel on if you want to record this in the Algarve album of plants. The second is Astragalus tragacantha ssp. vicentinus which is a member of the Pea family of plants - Fabaceae, formerly known as Leguminosae. It is a low-growing plant which is extremely spiny. 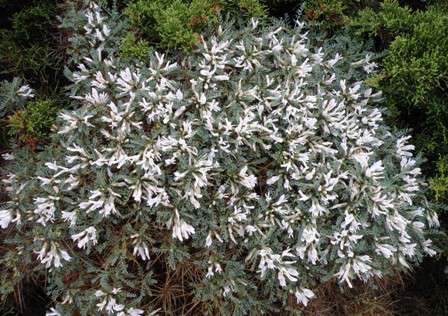 It has flowers which, from a distance, look pure white but on closer examination are delicately tinged with purple. Amusingly, the overall shape of the plant when viewed from a distance is said to resermble a 'resting sheep'. This is the time to look out for early migrants which are prepared to risk the most difficult weather conditions to arrive early in the Algarve in order to establish breeding territories in the best locatons. Birds to look out for include Western Yellow Wagtail, Woodchat Shrike, Black-eared Wheatears and the Great Spotted Cuckoo. Photographic proof that the guide books don't always get it right! A Ring Ouzel is a rare sighting. Distribution maps in the popular field guides and even the authoritative Handbook of Birds of Britain, Europe, the Middle East and North Africa would have one believe that the Ring Ouzel is not to be found in Portugal. They are all wrong. In fact, Ring Ouzels are a regular winter visitor in very small numbers to favoured sites in the Algarve and the windswept coastal scrub of Cape St. Vincent is probably the best place to look for them. The Song Thrush Turdus philomelos does not breed in the Algarve but it is a common winter visitor from northern Europe. This winter it seems to have arrived in particularly large numbers judging by how easy it is to see currently. 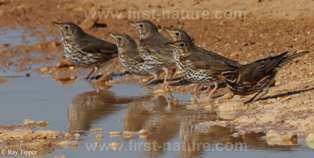 Being a shy species in the Algarve, it is not especially easy to photograph so news of parties coming to drink, along with Redwings Turdus iliacus, at several puddles at Sagres was of considerable interest. On a sunny day in mid-February we spent more than six hours beside the puddles using a car as a hide. As we manoeuvred into position it was clear there were plenty of thrushes around and in perfect light we were soon totally immersed in our photography. It was a memorable session not least because the first species to be photographed was neither a Song Thrush nor a Redwing but a Ring Ouzel, three different individuals coming to drink during the course of the day. 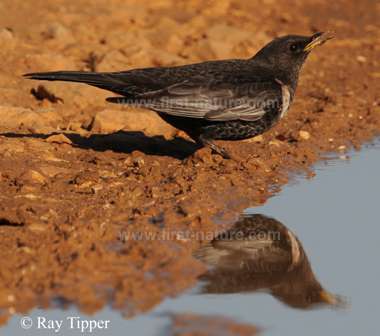 The puddles at Sagres are a big attraction for Song Thrushes and Redwings in February. A couple of special spring sightings. 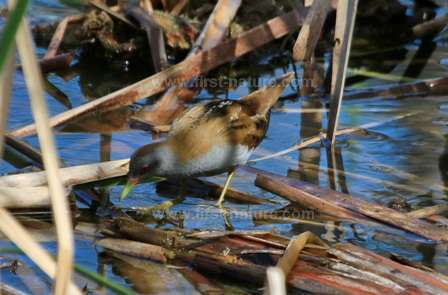 The Little Crake in its classic reed bed breeding habitat. Picture by kind permission of Harry and Jean McMahon. Also photogrpahed in March, the Little Crake is slightly smaller than the Spotted Crake and is distinguished by the presence of white spots on its flanks. They have green legs with long toes, a short straight beak which is yellowish at the tip and red at the base. The short tail is barred black and white beneath. In recent winters (January) the salinas around Tavira have played host to Short-eared Owls, a species that until the winter of 2010/11 was generally regarded as rare in the eastern Algarve. Their presence in three consecutive winters, therefore, gives cause to hope that they will become regular visitors in the future. 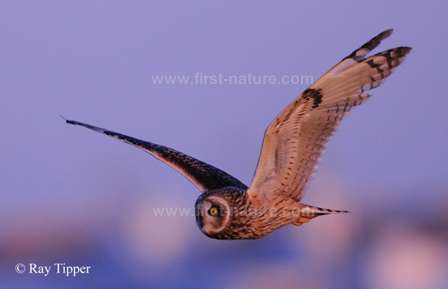 Short-eared Owls frequently hunt by day and the Tavira birds can regularly be seen on the wing in the late afternoon. So far this winter just two individuals have been recorded (there were up to four in 2010/11) and if they follow the pattern of previous years we could still be watching them well into March. Showing the Flamingos how to do what should come naturally..
Not mud pies - Flamingo nest mounds! 3rd February 2012. 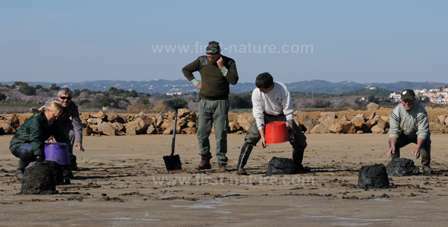 I was at Castro Marim Reserve today flamingo nest-mound building! You would think they would know how to do it themselves. Believe it or not, in other parts of Europe these mud piles have stimulated Greater Flamingos to breed at new sites. 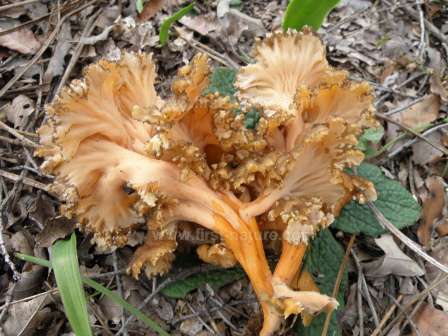 One of the special joys of a stroll in the woods at this time of year (late January to late March) here in the Algarve is the chance to gather a few edible wild mushrooms to serve up as a special treat. Of course, you do have to be careful, because certain kinds of mushrooms are toxic and easily confused with edible lookalikes. Beginners to fungi foraging are therefore strongly advised to steer clear of gilled mushroom, the group that contains most of the seriously poisonous ones. Among the safest of mushrooms, because they are so distinctive in appearance, are the various kinds of chanterelles. They do not have gills on the undersides of their funnel-shaped caps; instead they have either wrinkled surfaces or virtually smooth, matt surfaces. .
Two other plus points are worth a mention: firstly, chanterelles of various kinds are abundant in the Algarve, so it's very easy to collect say 150gm, which is quite enough for two people. The second big bonus is that two of our finest chanterelle species have bright golden caps that are easy to spot, even in the dim light of a dense woodland settings. Cantharellus cibarius is a large, chunky mushroom, while Cantharellus aurora is generally smaller and has contorted caps of a darker shade - this is one of the chanterelles with smooth surfaces beneath its caps. Both are common in pine and oak woodland, and I have even seen them under strawberry trees Arbutus unedo and on hillsides under some cistus species. Remember also that mushrooms vary somewhat in their appearance, so if you have any doubt about the identity of a mushroom, leave it out. Pat O'Reilly, author of Fascinated by Fungi says: 'Please always gather fungi responsibly. 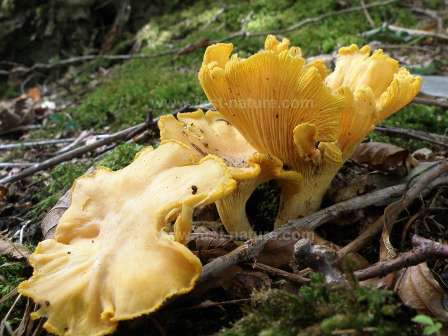 They are, after all, the main source of food for many kinds of wildlife creatures, so never take more than about a third of the chanterelles you find in a patch. Happy foraging."